I’ve been past a Polpo a few times, and the queues have always deterred me from going. The restaurant operates a no-reservations policy during dinner time which means if you want a table, you have to go early, wait or get lucky. So I decided to try my hand at turning up at 6.30 to see if I could avoid the queue. But alas, it was to no avail. A 45 minute wait ensued, and I have to say, it wasn’t the most pleasant of experiences. First, the bar is tiny with barely any standing space. Second, there were already loads of people waiting, which made the tiny space seem claustrophobic. Third, we were told we weren’t allowed to wait outside with drinks even though some people did. And finally, to make an unbearable situation worse, our drinks (a glass of proseco and coke) weren’t cold. The coke hadn’t been refrigerated, although we did get a glass of ice to go with it. Hmmm. But when we finally did get a table, I found the food to be quite delightful and the prices reasonable. Polpo is a Venetian style Bacaro with tapas-style dining. 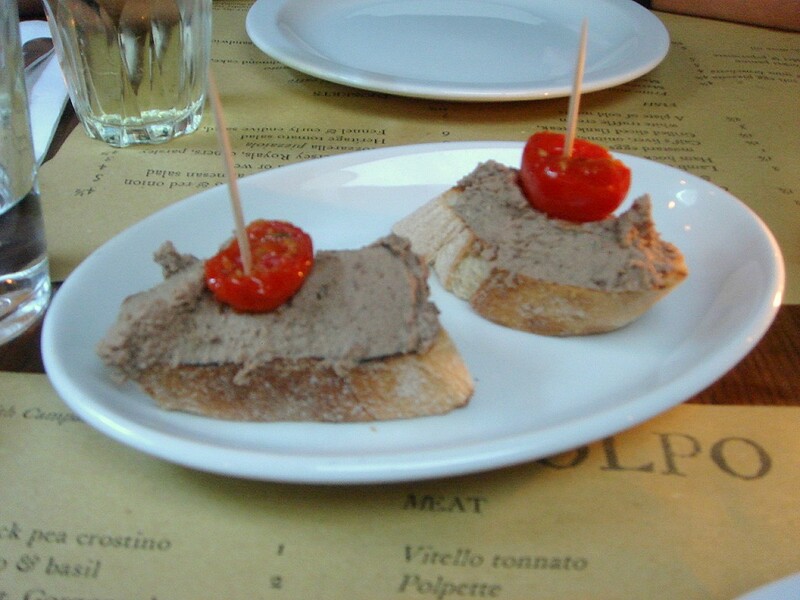 We started with some chopped chicken liver crostini (£1.50 each) which was rich with the flavour of pure liver. This was very tasty but it could have done with a little acidity to cut the richness. 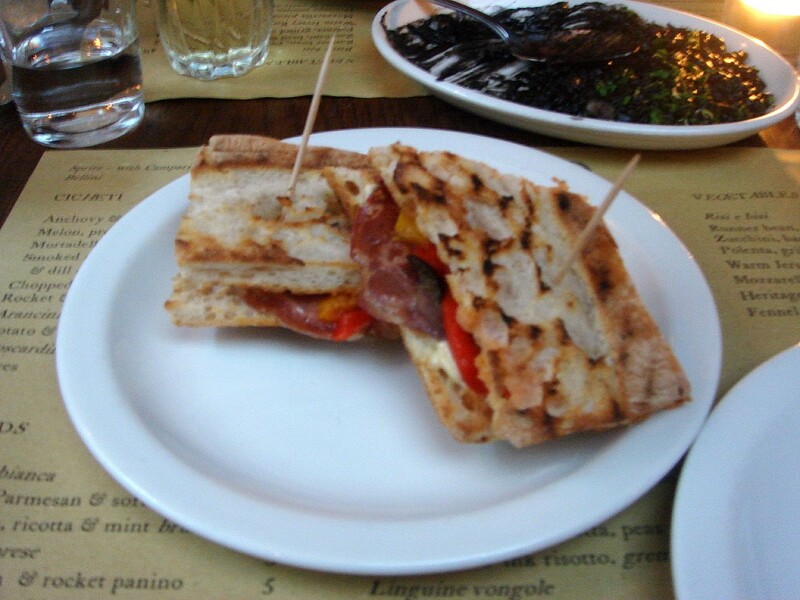 From the bread section, the cured pork shoulder and peperonata panino (£5), with a drizzling of olive oil, came with quite tasty meat and crusty bread. But there wasn’t much filling to speak of, so the thick slices of bread almost drowned out the flavour of the pork shoulder. It was therefore a little hard to justify the £5 price tag when we compared it to what we were paying for the other dishes. We went heavy on the seafood. 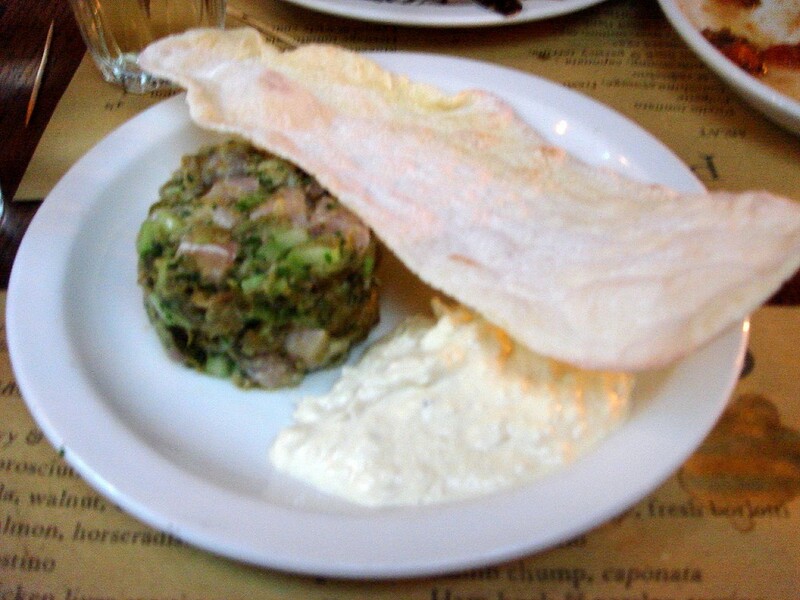 Mackerel tartare with horseradish (£5.50) was wonderfully fresh, and not too fishy. There was probably a touch too much lemon in the tartare, but it did not hide how good the tartare was. The horseradish was zingy, refreshing, and not too hot, and it matched wonderfully with the fish. 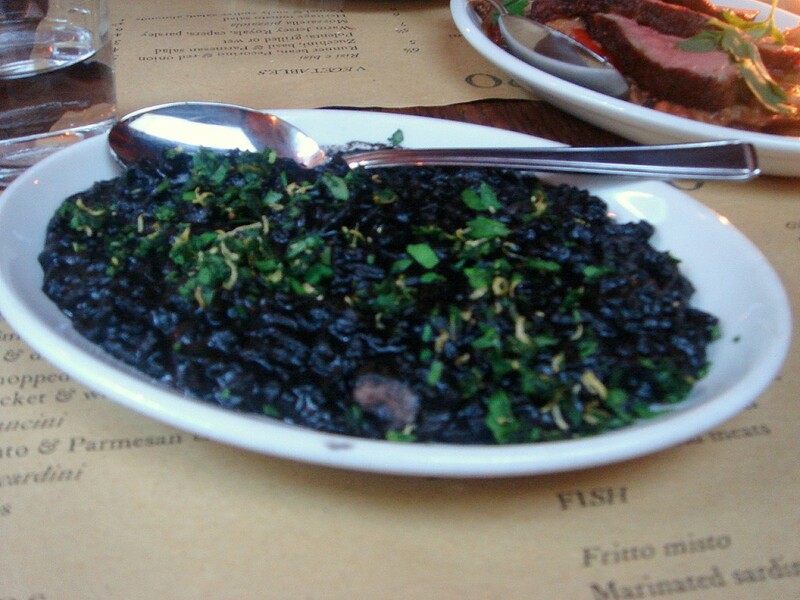 The cuttlefish and ink risotto (£6.50) yielded a nice inky flavour. But it was slightly under seasoned. The rice was also overcooked, and the quantity of cuttlefish was scant. 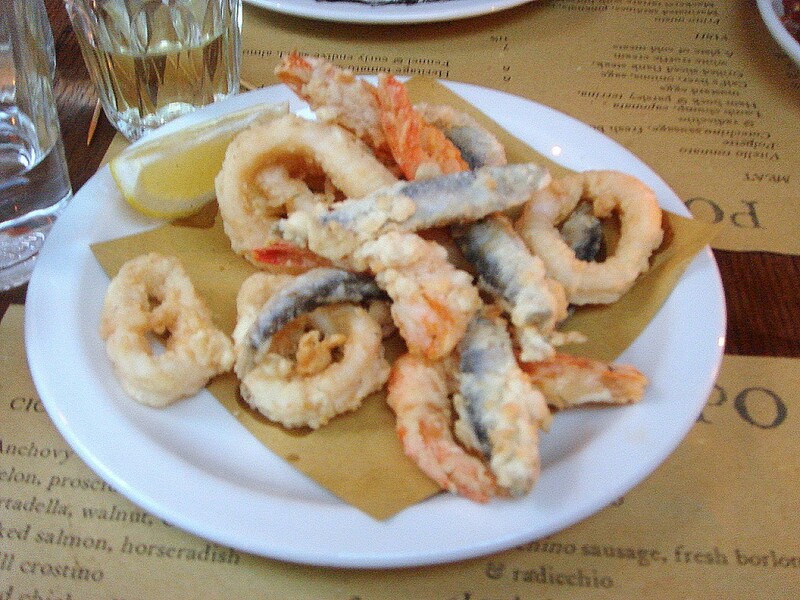 This dish was ok.
Fritto misto (£7) was made up of the usual mix of prawns, calamari and whitebait. The fried seafood was well cooked and nicely seasoned. The batter was very good and reasonably light. Lamb chump (£7) was tender with bags of flavour. Lots of summery vegetables made up the very tasty accompanying caponata. 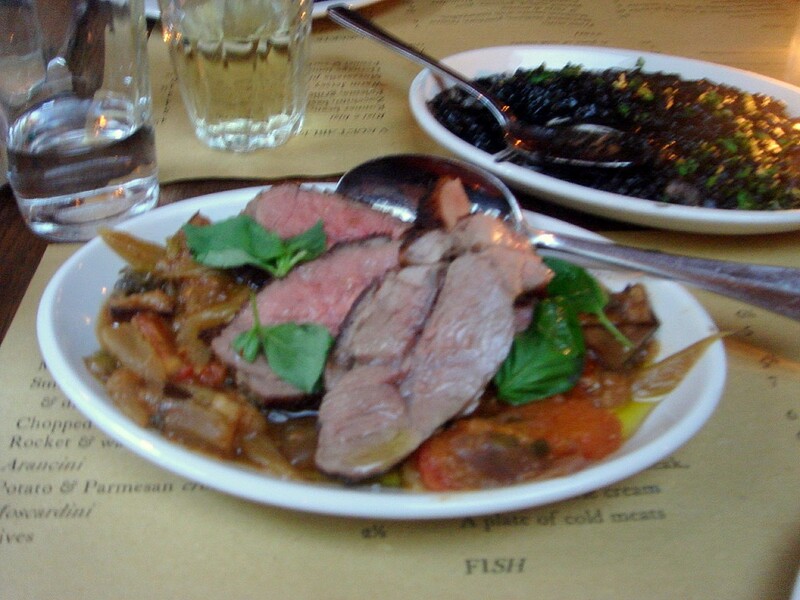 The fresh basil running through the vegetables was aromatic, and helped to enhance the sweetness of the meat. For dessert, we went for the affogato al caffe (£2.50) and the flourless orange and almond cake with mascarpone (£4.50). 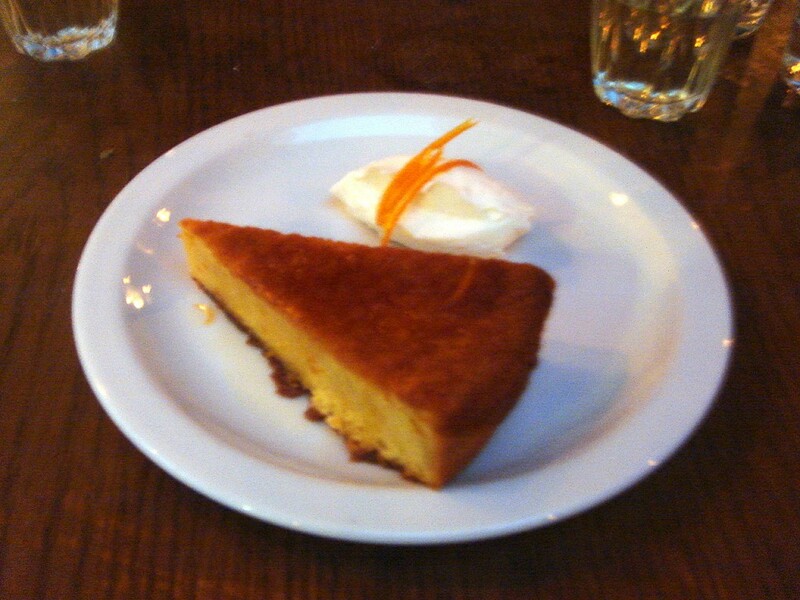 The affogato was yummy, but it was the orange and almond cake which held us spellbound. It was amazingly good. Moist and decadent, it was the outstanding dish of the evening. To finish, we also selected the chocolate and apricot salami (£2) which bore a close visual resemblance to black pudding with bits in it. It was ok, but it tasted more gritty than chocolate-y. The service wasn’t bad, but it was occasionally hard to come by. The ratio of waiting staff to covers is low, so you need to be strategic about grabbing them as they come flying pass. As for the décor, it was a little quirky and a touch kitsch. Even some of the waiting staff were quirkily dressed. And as you might have imagined from my description of the bar, there wasn’t much space in the dining room either. Tables are almost stacked side by side. Overall, the food at Polpo was quite good. I also found the prices quite reasonable, so it’s no wonder it brings in the crowds. I’d go again, but it’s such a shame that the wait is less than pleasant. After Polpo, I’d definitely be interested in trying Polpo’s new sister restaurant, Polpetto, which opened on Monday 23 August. Prices: About £30 per head, excluding drinks and service. I’m a fan of Polpo and liked the food at the new Polpetto at least as much (I snagged a spot at the 50% off soft opening this weekend). I agree with you that the wait can be frustrating however – and discourages me from taking big groups of friends. Ah yes now you have been to Polpo next stop Polpetto!